Red velvet cupcakes are all the rage, and for good reason: They’re tasty. If you’re nowhere near a cupcake shop on Valentine’s Day and don’t want to use the time and copious bottles of red dye to make red velvet cupcakes, fear not. Duncan Hines has stepped in with red velvet cake mix. It ain’t half bad, but it certainly ain’t the real thing either. When you decorate your red velvet cupcakes, consider using white liners so the red shows through, and leave a little cake showing at the edge when you frost. 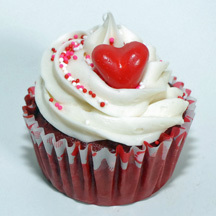 What You Need: 1 red velvet cupcake (baked and cooled); white frosting; pastry bag; size 1M metal icing tip; red, white and pink sprinkles; red candy heart. How to Make It: Fit 1M metal tip to disposable pastry bag (the 1M tip is larger than standard size; a disposable bag means you won’t have to cut so far into a cloth bag). Fill pastry bag halfway with white icing. While squeezing out icing, move arm in a circular motion and cover the top of the cupcake with a swirl of icing. Then, starting a little bit in from the edge this time, make a second swirl on top of the first one. Immediately add candy sprinkles and place heart candy strategically in the swirls. This entry was posted on Friday, February 8th, 2008 at 11:14 pm	and is filed under Valentine's Day. You can follow any responses to this entry through the RSS 2.0 feed. Responses are currently closed, but you can trackback from your own site.